There are many different ways to make a knitting hat pattern. The one presented on this page is a classic way of knitting hats. Once you get an idea how to make patterns and to shape a hat using decreases, you will be able to design your own hats without any problems. I will show you all details necessary for knitting this particular hat. If you follow me, you will be able to knit exactly the same hat. As usually, I don't suggest you to follow my instruction exactly. Feel free to change anything you wish. This is the best way to learn something. Besides that all of us have different preferences, vision, and sense of beauty. I'll explain you how this particular knitting hat pattern was designed. Use it as a base model, and welcome to the creative world! A bottom edge (15 rows = 5 cm = 2 in) is folded inside a hat and sewed on to a hat in a few points. It has a folded line to fold brim inside a hat. To knit a folded line: Row 1: * Knit 2 together, yarn over*. Row 2: Purl. Line AB is the beginning of the decreases, to shape a hat. A hat can be worked either way: 1. In the rounds with the circular knitting needles or with the double pointed knitting needles. 2. Working flat with the straight knitting needles. This way your hat will have a vertical seam. Patons Classic Wool. Merino. 100 % Wool. 223 yds./204 meters. 3 1/2 oz/ 100 g.
Size 2 (2.75 mm) straight, circular or double pointed needles. 1 cm = 2.14 sts. 1 cm = 3.33 rows. Bottom part of the crown: Stockinette stitch (right side). Crown: Revers Stockinette stitch + 6 a 4-stitch cables. Number of stitches necessary to begin. NOTE: Calculations are made for 56 cm measurement made around the head. (an average adult). Cast on: 56 cm x 2.14 sts/cm = 119.84. Round to 120 sts. For working a flat hat with a seam, cast on 1 selvage stitch for seaming at the very beginning and the end of the first row. (122 sts total). Knit a folded line. Row 16: * Knit 2 together, yarn over*. Row 17: Purl. Row 18 - Row 32: Stockinette stitch (right side). Row 33: Change a stitch pattern to the cables: Purl 8 sts, * knit 4, purl 16*, knit 4, purl 8. NOTE: There are 6 cables in this pattern and 16 purl stitches between each of them (120 sts total).In case you are working flat with a seam hat (122 .sts) , make "purl 9" instead of "purl 8". Row 34 - Row 61: Continue to follow the stitch pattern and a knitting hat pattern. Row 62 - Row 82: Make decreases, to shape a hat. Decrease 1 stitch before each cable and 1 stitch after each cable (12 decreases per each of these rows: 62, 66, 70, 74, 78, 82, 84, 86, 88). There will be 12 stitches on the needles after you finish decreases. In case of a flat knitted hat sew a seam. Fold bottom edge (5 cm ) inside of a hat and sew it on at the few points. Using gauge and circumference of your head, calculate the number of stitches to begin. Knit a brim. in every 4th row decrease one stitch at the beginning of each of 6 groups ( 5 - 6 cm). In every 2nd row decrease one stitch at the beginning of each of 6 groups till there are about 10 stitches on the needles. 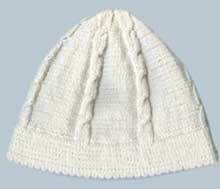 A knitted hat, presented on this page, was knitted with the thin needles (#2 / 2.75 mm). I wanted to have a thin and dense knitted fabric on my hat. Hence, the original number of the stitches was pretty high (122 sts). That's why I made 12 decreases each time instead of the traditional 6. Nevertheless, I still followed the formula: 6 parts, 12 cm after brim, 5-6 cm made decreases in each 4th row, and then made decreases in each 2nd row till I had 10-12 stitches left.